180 degrees swivel head with dual lighting: 3-LED or 5-LED. 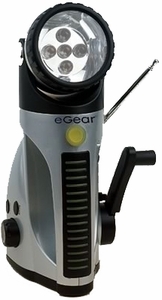 Powered by 3-phase alternator motor and internal rechargeable NiMH batteries, which never need replacing. 3 ways to power up: wind up generator; 12V AC/DC vehicle cigarette lighter socket adaptor included; 12V AC/DC adaptor (not included). Cell phone charger adaptor kit included. 1 minute 15 min. 30 min. 30 min. 3 minutes 25 min. 60 min. 60 min. 5 minutes 35 min. 80 min. 80 min.